Any Currency won, but was subsequently disqualified by the British Horse Racing Authority for a positive sample. The positive sample was taken on the day of the race, but the disqualification by the disciplinary panel was only confirmed on August 25. The runner-up in the Cheltenham race, Josies Orders trained by Enda Bolger, owned by JP McManus and ridden by Nina Carberry, was been awarded the race. One of racing's top Jump jockeys rode his second Festival winner today, a long seven years after the first. 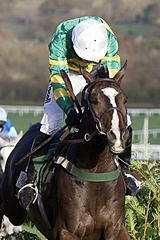 Aidan Coleman finally found the elusive next one thanks to Any Currency, who won the Glenfarclas Cross Country Chase. The victory, a first at the Festival for trainer Martin Keighley, followed Coleman's win on Kayf Aramis in the 2009 Pertemps Network Final. The winning jockey said: "He [Any Currency] massively deserved this. He seems to be pretty evergreen at 13 years old - who said they need to retire when they get older? He's been second twice [in the past two years] and to finally win it is great. "He's just a pleasure to ride and I wouldn't mind taking him hunting when I retire. He's an easy ride and it's just a pleasure to be involved with him." Keighley is a former member of Cheltenham's groundstaff, and Coleman added: "There's only one thing that knows this place better than Martin, and that's this horse - no disrespect to [clerk of the course] Simon Claisse. "I was delighted to hear the conditions of this race had been changed [it was formerly a handicap] because it brought everything into the horse's favour. It was a great shout by Martin to take the hood off, and to put ear plugs in that we took out at the start. It made a massive difference because he travelled with such enthusiasm. He's never travelled so well, and for a moment I wondered if we had gone a proper gallop because he was going so well. "This [second] winner has taken me long enough. 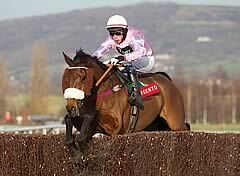 I've had a few great seasons, but the lack of a Cheltenham winner has been a cloud in all of them. You are never discouraged and today it was great to get one - I just hope I don't wait seven seasons for the next one." Josies Orders stayed on strongly up the Cheltenham hill but couldn't quite get to the 11/1 winner Any Currency this afternoon. The 15/8 favourite was given a customary waiting ride by Nina Carberry but was under pressure turning for home and the response wasn't quite as instant as it had been when the eight-year-old had won the two Cross Country races at Cheltenham earlier on this season (at The Open and International meetings). The son of Milan began to motor home as the field jumped the last but it was too little, too late as Any Currency held on to record a length victory. Trainer Enda Bolger was happy enough with Josies Orders after the race. "He's run well but we couldn't quite get there," said the trainer. Bless The Wings finished a further length and a quarter back in third and trainer Gordon Elliott was delighted that the 11-year-old had managed to outrun his odds of 33/1. "He's run well," the handler reported.